There's nothing quite like the spectacle of the Super Bowl! The showpiece finale to the NFL season has, certainly in recent years, provided us with drama and excitement of the highest order, but the chaos isn't just limited to the events inside the stadium come game day. Here, I will attempt to navigate you through the build-up to a Super Bowl, and provide an insight into just what goes on behind the scenes. So, it wasn't quite the Super Bowl we all hoped it would be. 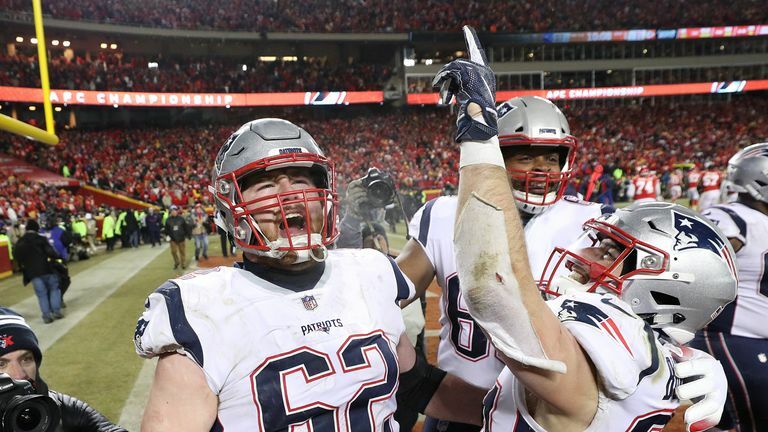 But, it was at least a close game - coming down to the wire in the fourth quarter before Tom Brady and the New England Patriots ultimately made history with a sixth Vince Lombardi trophy win. Super Bowl LIII in the spectacular setting of the Mercedes-Benz Stadium in Atlanta turned out to be a bit of a drab affair - the lowest scoring game in Super Bowl history - with the Patriots ultimately prevailing 13-3. Head coach Bill Belichick, who has provided over each of the six championship wins, said his New England team "played like champions", adding: "It's all about the players, they've worked so hard all year and competed every week and they competed today, like champions. "They [Rams] are a great football team and they are well coached but it's about the players - they made the plays, they stopped the run, they covered the receivers and they tackled the quarterback." As for the Rams. The high-scoring, explosive offense we were treated to during the regular season punted, and punted, and punted some more. So much so that up until the Patriots' fourth quarter surge, the play of the game had been a Super Bowl record 65-yard punt by Johnny Hekker! 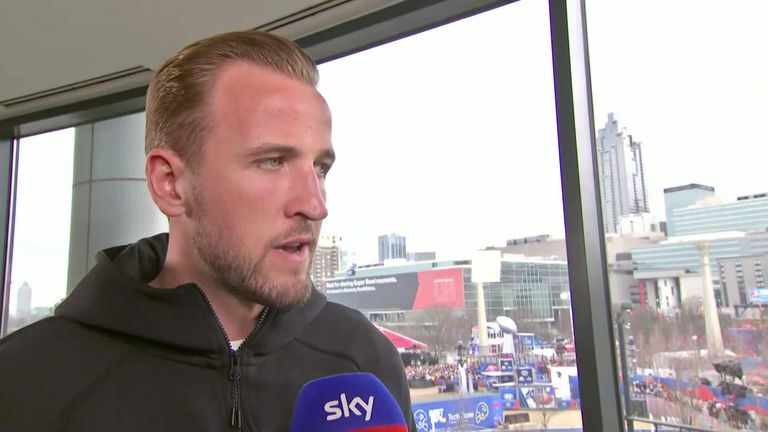 It was ball striking the like of which Harry Kane would be proud off - (seamless segue) - who was in attendance in Atlanta to see his beloved Patriots triumph while he still recovers from his ankle injury. Shameless selfie No 2 of the week from yours truly - see below for some San Francisco 49ers bothering earlier in the week. Tottenham and England striker Harry Kane says his ankle 'feels great at the moment' as he continues his recovery from injury. Gareth Southgate was also stateside for the game, joining us in the studio to discuss the role the NFL has had to play in his coaching of the England football team and formed an unlikely friendship with Rob Ryan - a coaching combo that one day has to happen! 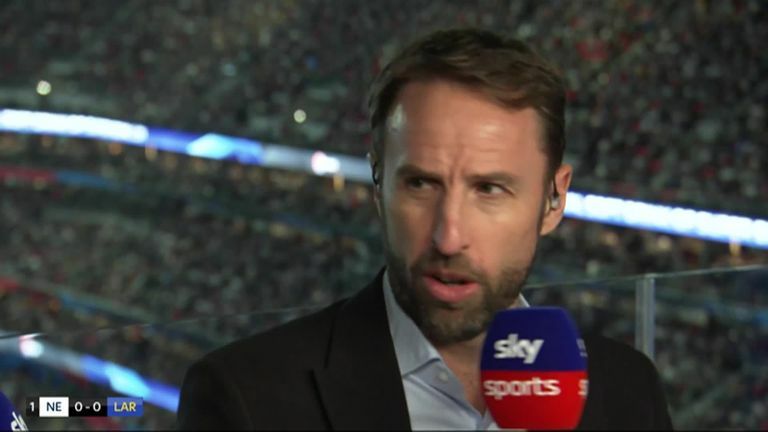 England manager Gareth Southgate tells Sky Sports what can be learnt from the NFL as he takes in Super Bowl LIII. For now though, we sadly say goodbye to Rob - as he returns to the NFL - goodbye to another incredible Super Bowl week and consign another NFL season to the record books with the familiar finish of the Patriots celebrating as the confetti falls. Radio Row now dismantled, it was off to Rob's presidential suite (ish) for the recording of the Super Bowl LIII preview Inside the Huddle show. Bucky Brooks and Shaun Gayle were welcomed to the fold, with our on-air lineup for Sunday's game now complete. We got predictions from the gang on the big game, and also grabbed a word with Bucky on Rams, and Arsenal, owner Stan Kroenke. Perhaps coming as quite the surprise to a disenchanted Gunners fan base, Bucky praised the job Kroenke has done with 'Hollywood's team' and spoke of the need for patience from the Arsenal supporters. Ahead of their Super Sunday clash against Manchester City, Bucky said: "The Rams fans are very happy with him. He has put things in place and built it up in such a way that they have been able to win. That's all the fans want. "I feel it's just a matter of time at Arsenal too. I think as he devotes more of his time and energy to building up the team, you'll start seeing the same approach produce similar results. Filming done, and with a rare afternoon off, it was time to take in some college basketball at a local bar, before a team meal and perhaps a couple of ill-advised drinks before the big game. One more sleep to the Super Bowl. Richard Graves, or 'Grovesy' as he has become affectionately known following a Twitter spelling mishap earlier in the week. The man with the exclusive. 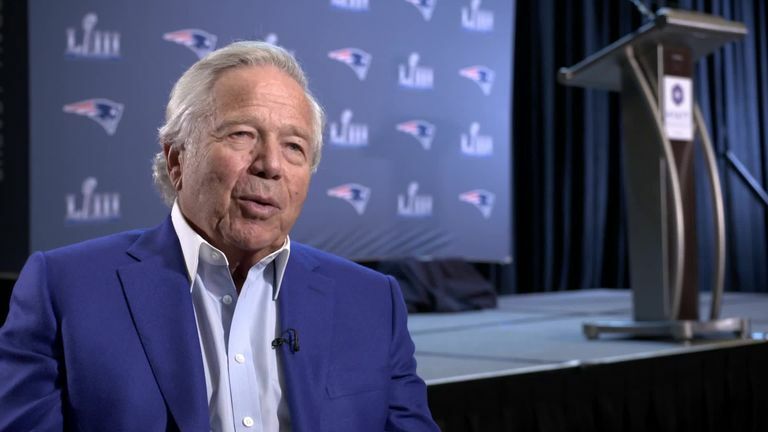 New England Patriots owner Robert Kraft is optimistic fate may see his side to Super Bowl victory against La Rams, the side his team beat for their first success in 2002. A day on from snagging his traditional one-on-one sit down interview with Patriots owner Robert Kraft - a sight as familiar as a Patriots Super Bowl in itself - the Sky Sports News NFL nut next had in his sights rugby-turned-NFL-wannabe Christian Wade. Kraft talked of how the Patriots will "do everything we can" to keep Tom Brady, while Wade spoke of his Super Bowl trip being a reward for the tough work he is putting in to his NFL dream. Meanwhile, behind the camera, during Wade's walk and talk, Hannah Wilkes of Sky Sports Game Changers fame was given the tricky task of clearing the path on an increasingly busy Radio Row for our backtracking cameraman Simon Gunby. 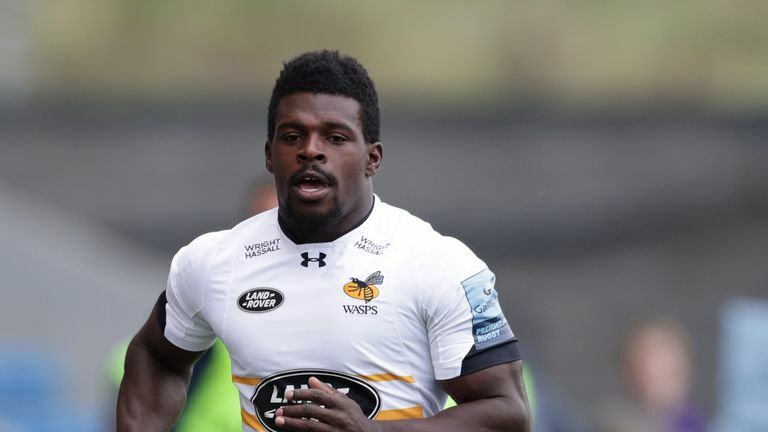 Former Wasps winger Christian Wade discusses his progress in becoming an NFL player with Sky Sports' Richard Graves ahead of Super Bowl LIII. While Hannah's efforts were admirable, San Francisco 49ers head coach Kyle Shanahan might not think so, as she channelled her inner Christian Wade and practically rugby talked him aside when blocking the gangway. Hannah knew better than to tackle WWE superstar Mickie James though during their interview later in the day. As for Shanahan, the head coach, he wasn't the only 49er out in force on Friday, with three-time Super Bowl winning legendary San Francisco receiver Jerry Rice also in the building. One shameless selfie from a certain Sky Sports NFL editor (and 49ers fan) later and he was allowed on his way, free from any harm from Hannah. Jay Ajayi, Kurt Warner, Shannon Sharpe, Eric Decker, Terrell Davis, Russell Wilson, Von Miller. Radio Row is now really picking up the nearer we get to Super Bowl Sunday, with those guys just a few of the big names networking in Atlanta. And they're just the names from the NFL. Also doing the rounds (and taking selfies with Rob Ryan) on Thursday was WBC heavyweight boxing champion of the world, Deontay Wilder. Just don't tell him he's an Anthony Joshua fan. British running back Ajayi and former Super Bowl winner with the Rams, Warner, joined Neil Reynolds and Jeff Reinebold - fresh from a lost luggage drama, but more on that in a minute - on Wednesday's recording of Inside the Huddle, where Ajayi talked on his eagerness to test out free agency this offseason. 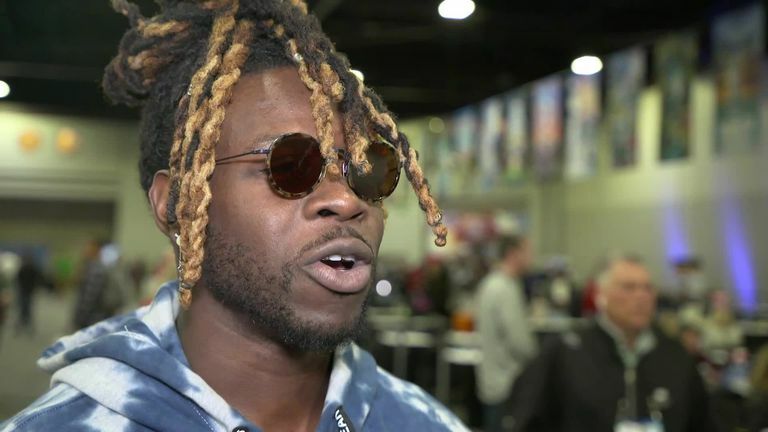 Philadelphia Eagles running back Jay Ajayi says he hopes the Los Angeles Rams can beat the New England Patriots at Superbowl LIII. Three-time Super Bowl winner Sharpe, and another former Denver Bronco, Decker, also joined Neil and Jeff on the show which, remember, you can watch nightly at 9pm on Sky Sports USA in the lead up to the Super Bowl. Right, back to Neil's lost luggage. Followers of @neilreynoldsnfl may well be aware that Neil left the airport on Sunday without one of his bags, seemingly one containing his suits for the week and ready for Sunday's broadcast was lost by the airline. Three days of frantic phone calls, emails back and forth, and fervent fretting over the lost luggage, it turns out Mr Reinebold accidentally collected said bag at the airport and had it all along! Fumble No 2 of Super Bowl week. It was another busy day for Rob Ryan on Radio Row out in Atlanta. Having only just joined up with the Sky Sports Super Bowl team the day prior, it was announced he was to be leaving us and returning to coaching with the Washington Redskins for next season. Rob Ryan is back in the NFL having been hired as the inside linebackers coach for the Washington Redskins, the team announced on Wednesday. But for now, Coach was put to work, heading to the Patriots' latest media session to catch up with some former colleagues. Brady is a hard man to get time with on Super Bowl week, with an army of reporters, cameras, cameramen and just the odd smattering of Brady fanatics attending each of his appointments with the press. But, when you are a Ryan, the normal rules do not apply. Tom Brady is set for his ninth Super Bowl, looking to win his sixth! The G.O.A.T talks to Coach Rob Ryan in an exclusive interview for Sky Sports - watch on Sky Sports USA on Sunday. First in line and first in with the questions to a somewhat startled Brady, not expecting to see his former coach in front of his podium. 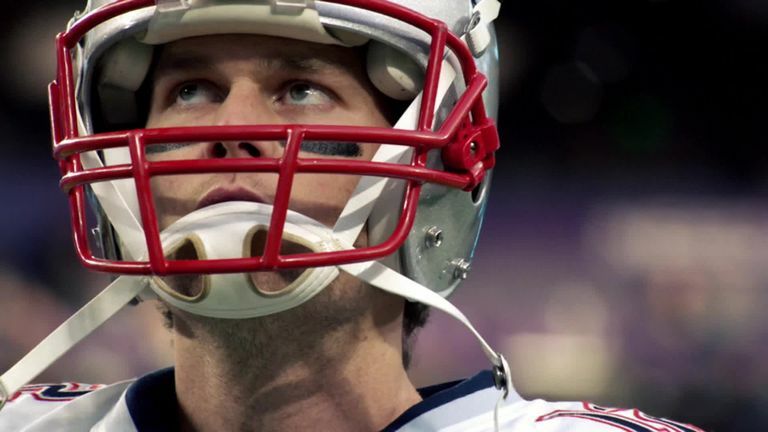 Some Super Bowl reminiscing, and a bit of gym talk - seriously - later, and the focus turned to Sunday's game, with Rob particularly wanting to know what makes Brady the best when it comes to game-winning drives? The veteran quarterback has 12 in the playoffs, with five coming in the Super Bowl. "I've always looked at that as an opportunity," said Brady. "If you're losing with two minutes left, what's the worst that can happen? You're already losing. "It's a win-win situation. If you lose, well, we were already losing. If you've got a chance to go back and win and make the plays, that that's what everyone is going to be talking about the next day. So you figure, you know what, I've got a chance to be a hero." Rob also got some one-on-one time with offensive coordinator Josh McDaniels, to ask him about his thriving partnership with Brady and how the two make it work. Broadcasting's loss is no doubt the NFL's gain. Our second day in Atlanta signalled the return of Rob. 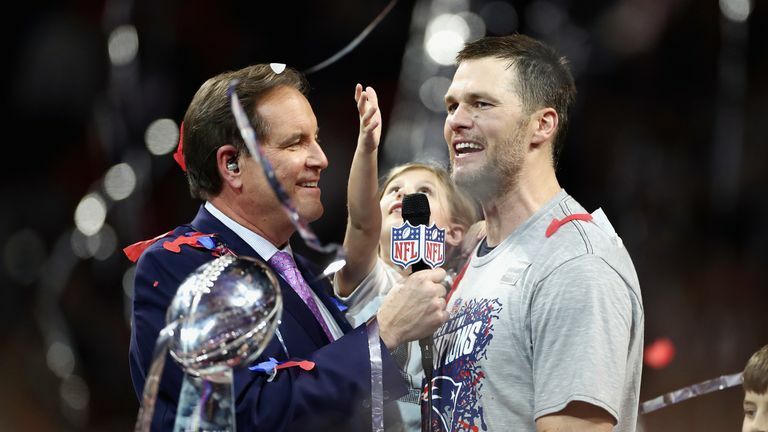 A key contributor to Sky Sports' NFL coverage over the past two years and part of our Super Bowl LIII broadcast, the former defensive coach is a two-time Super Bowl winner with the New England Patriots, and so is well versed in the unique kind of chaos of Super Bowl week. His is also well connected. Mere hours after facing the media on opening night, the Rams players are back in front of the cameras, this time at a slightly more (only slightly) civilised session, sans screaming fans and silly costumes. And, it takes just one lap of the hotel conference centre in which the media session is being held to see Rob's still strong ties to the league. As he circled the room, handshakes (and the odd bear hug) were served out with increasing regularity, including one to 20.5-strong sack machine - and likely NFL defensive player of the year - Aaron Donald. It was the moment to capture, unless you happened to accidentally film a one-second video of your pocket instead. The first fumble of the Super Bowl. Moving on. Back to Radio Row for the filming of the latest Inside the Huddle, which saw the return of another familiar face to Sky Sports' coverage, with Solomon Wilcots joining Rob and Neil Reynolds and Jeff Reinebold on set. Then, in the evening, it was time for the world's media to let their hair down at a 'media night' held in the Georgia aquarium. Only at the Super Bowl. 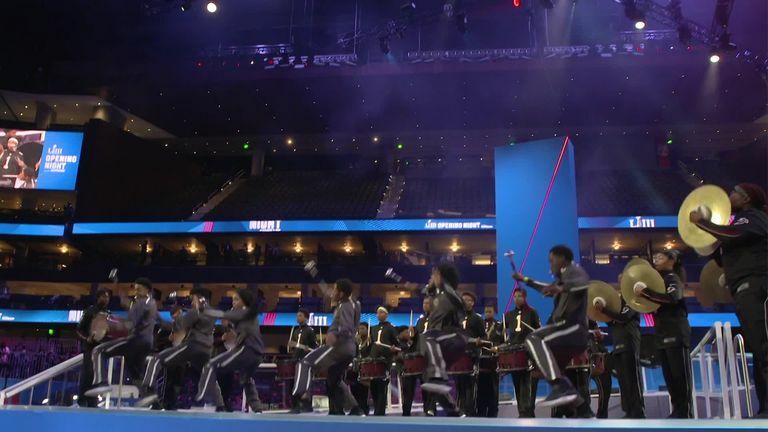 The centrepiece of media week comes at the very start of it, with both teams made available to the media masses for 60 minutes worth of questions each, all played out in front of a near packed-out 21,000-seater State Farm Arena (home of the Atlanta Hawks basketball team). The New England Patriots and the LA Rams have been meeting the media and fans at the official Super Bowl opening Night in Atlanta. Any and all questions are asked, and by any and all reporters, armed with any and all sorts of strange costumes and gimmicks to hand. For the Rams, this is all new. Or certainly for most players it is. Only four of their team - compared to 36 for the Patriots - have ever been to the Super Bowl before. For New England, the madness of media week and opening night is now the mundane, the norm. Certainly for Brady. 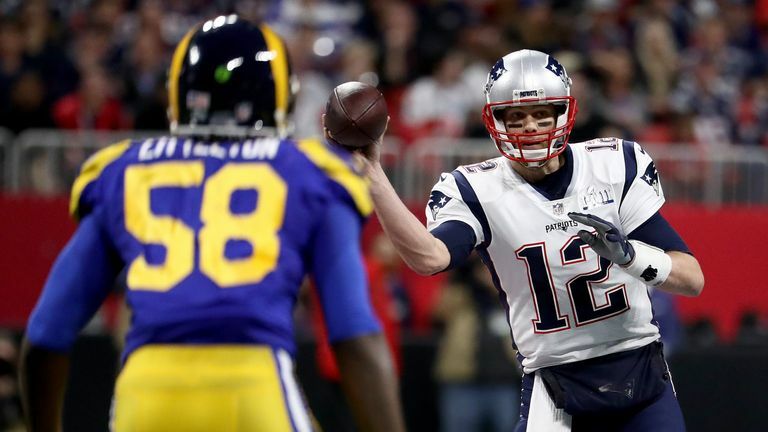 Take a look at how New England Patriots made it to Super Bowl LIII, where they will face the Los Angeles Rams. This is far from Brady's first rodeo. It is his ninth in fact and his fourth in the last five years. The 41-year-old, chasing a record sixth Super Bowl success, ducks and dodges questions as expertly as he does defenders. It's an art form. As the two teams met on stage midway through the media circus, an ever-relaxed Brady said with a smirk he's "not giving him [Jared Goff] any advice" while sitting next to his quarterback counterpart who looked every bit the 17 years his junior. Brady is not, however, the only one operating in familiar surroundings. Jeff has again adopted the roving reporter role for @SkySportsNFL and Neil is fronting Inside The Huddle from 'Radio Row', among the assembled global media - broadcast daily at 9pm on Sky Sports USA, starting Tuesday. Neil and Jeff also will give a greater peek behind the scenes at Super Bowl week on the Inside The Huddle EXTRA podcast, with the first episode available to download here. Neil's success, or lack of it, at the NFL Experience was the main point of contention. Forgetting Sunday's Patriots and Rams title tilt briefly, first there was a bigger score to settle as Neil, Jeff and Sky Sports News' Richard Graves (Groves?) did battle in the quarterback passing challenge at the fan experience. Let's just say Brady needn't be worried.